Hugh of Lincoln, sometimes known as Little Saint Hugh (sometimes “Little Sir Hugh”) to distinguish him from Saint Hugh of Lincoln, was an English boy whose death was falsely attributed to Jews. Hugh is sometimes known as Little Saint Hugh (sometimes “Little Sir Hugh”) to distinguish him from Saint Hugh of Lincoln, an adult saint. Hugh became one of the best known of the blood libel saints (generally children whose deaths were interpreted as Jewish sacrifices). It is likely that the Bishop and Dean of Lincoln steered events in order to establish a profitable flow of pilgrims to the shrine of a martyr and saint. The event is particularly significant because it was the first time that the Crown gave credence to ritual child murder allegations, through the direct intervention of King Henry III. The nine-year-old Hugh disappeared on 31 July, and his body was discovered in a well on 29 August. It was claimed that Jews had imprisoned Hugh, during which time they tortured and eventually crucified him. It was said that the body had been thrown into the well after attempts to bury it failed, when the earth had expelled it. Shortly after news was spread of his death, miracles were attributed to Hugh; and he was rushed toward sainthood. Hugh became one of the youngest individual candidates for sainthood, with 27 July unofficially made his feast day. However, over time, the issue of the rush to sainthood was raised, and Hugh was never canonized. He never appeared in Butler’s Lives of the Saints(1756–1759). The Vatican never included the child Hugh in Catholic martyrology. His traditional English feast day is not celebrated. The shrine dated to the period immediately after the expulsion of the Jews. The shrine itself was destroyed in the Reformation, or possibly the Civil War. Trumped up stories of “ritual murders” of Christian boys by Jewish communities were common throughout Europe during the Middle Ages and even much later. These fictions cost many innocent Jews their lives. Lincoln had its own legend and the alleged victim was buried in the Cathedral in the year 1255. Lord, forgive what we have been, amend what we are, and direct what we shall be. All whose lives end in mystery and tragedy. All who stand falsely accused. People who are feared through ignorance, intolerance and for political ends. People who are brave enough to confess their wrongdoings and to amend their lives. All with the grace to forgive. The Elder set out for the Tabenna monastery, but he did not see the one indicated to him in the vision among the sisters. Then they led Isidora to him, considering her a demoniac, because she worked in the kitchen and fulfilled the dirtiest, covered her head with a plain rag, never became angry, never insulted anyone with a word, never grumbled against God or the sisters, and was given to silence. To the astonished questions of the sisters the Elder replied, “Before God, Isidora is higher than all of us!” Then the sisters began to repent, confessing their mistreatment of Isidora, and they asked her forgiveness. The saint, however, distressed over her fame, secretly hid herself away from the monastery, and her ultimate fate remained unknown. all who unassumingly take on tasks others consider menial. all who have no desire to stand out. all who tend toward silence. all who make a habit of overlooking others. all whose minds flit about uncontrollably. Catherine of Sienna is a celebrated mystic. She entered the Dominican order at 16 and died aged 33. She wrote extensively, including some words about the gift of tears. Tears express an exquisite, profound sensitivity, a capacity for being moved and for tenderness. Young people who have vibrant faith in Jesus. All whose prayers are expressed through tears. All whose visions and writing draw us Godward. It is easy to forget that our ways are not God’s ways, that there is usually a stark difference between what is popular and what is holy. God has given us some pretty unusual people to make that point clear through the example of their own lives. They are known in the Orthodox Church as “Fools for Christ” who acted and spoke in ways that made them appear crazy in the eyes of many and went against the grain of their societies. Through their unique witness, they called their neighbours to the life of a Kingdom not of this world. 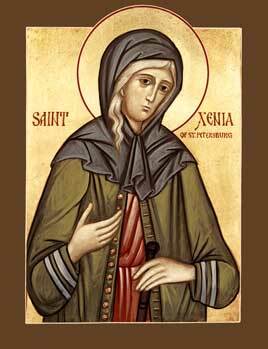 Today we commemorate Saint Xenia of St. Petersburg, Fool for Christ, who in the early 18th century in Russia became a widow when her husband, a military officer, died suddenly. A young widow with no children, she gave away all her possessions to the poor and vanished from society for several years, devoting herself to spiritual struggle in monastic settings. When she returned to St. Petersburg, she took up the life of a homeless wanderer, wearing her late husband’s military uniform and answering only to his name Andrew. She prayed alone at night in open fields, endured the extreme cold with inadequate clothing, lived among beggars, and suffered abuse from many for appearing insane. She secretly carried heavy stones at night to help with the building of a church and gave the alms she received to the poor. But she embraced her struggles with patience, abandoning pride in all its forms and praying for the soul of her departed husband. In Xenia’s humility, God gave her great gifts of prayer and prophecy, and she foretold future events such as the death of a Russian empress. Across the centuries, the Lord has raised up such unusual saints in order to shock us out of our complacency, in order to remind us that there is far more to becoming a partaker of the divine nature (2. Peter 1:14) than leading a conventionally respectable life. Christ surely does not call us all to the rare ministry of a Fool for Christ like St. Xenia, but we may all learn from her example that the humility of embracing our constant need for mercy is at the heart of faithfulness to a Lord Whose Kingdom is not of this world. There must be something of the holy fool in us all, if our eyes are to be opened to a truth that the world does not yet see. So let us not be afraid to live accordingly and to be out of step with the conventional wisdom, for that is how we will follow Jesus through the folly of the cross to the glory of the empty tomb. For Christ’s foolishness is wiser than the wisdom of the world, and He is its salvation. The people of St Petersburg. All who seek to lose the identity they were born with. All who help others despite their own struggles. All who give generously, seeking no praise. All who make us uncomfortable. All who make us think. All who are discovering faith in Christ. All who faithfully and patiently call our attention to God. All who long to be made clean. All who are soothed by water.